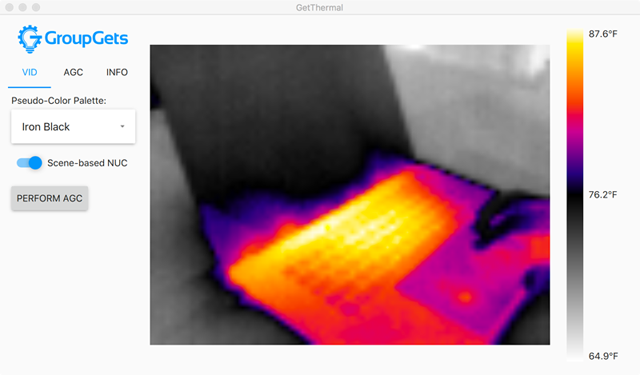 The PureThermal 1 FLIR Lepton Smart I/O Module is a hackable thermal webcam module for the FLIR Lepton LWIR camera core. It ships pre-configured to operate as a plug-and-play UVC 1.0 USB thermal webcam that will work with standard webcam apps such as VLC Media Player on PC, Linux, Mac, and even Android. For developers and the more curious, it's reference firmware and hardware schematic are open-source for customized applications and alternate command, control, and video output channels such as analog. The FLIR Lepton camera core is required for operation but not included in the base unit price since many of our users already have Leptons. Get PT1 Now. STM32F412 ARM microprocessor. Execute on-board image processing without the need for an external system. PureThermal 1 boards made before 3/24/17 contain the STM32F411CEU6 ARM microprocessor and not the 412. A. This board is compatible with all current generation Leptons (25°, 50°, 50° shuttered, the radiometric 2.5, and 3.0). We recommend the Shuttered 50° HOFV Radiometric Lepton™ 2.5 or the Lepton™ 3.0 with PT1. Q. Which apps work with PT1 on various platforms? Q. How can I download debug code on-target for this board? Can I debug over JTAG? A. We have broken the JTAG signals out to a ZIF socket to be used with a debugger/emulator. Our ARM MCU JTAG adapter board can be purchased seperately, and includes connections to plug in an STLink/V2, Nucleo, JLINK, or other JTAG pod. Q. 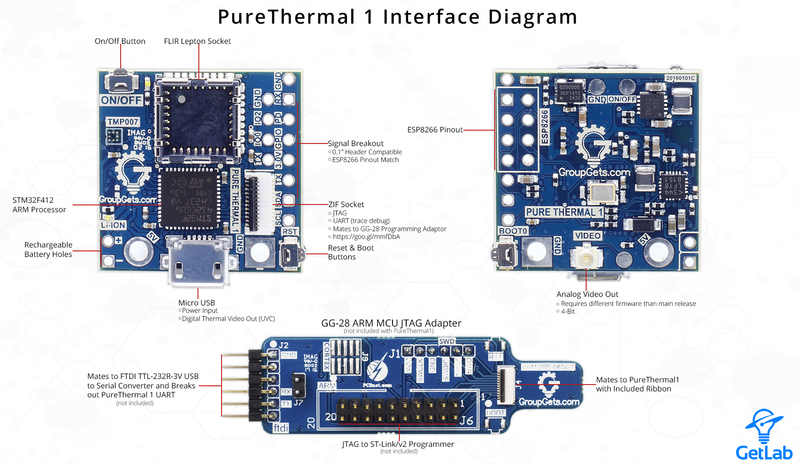 How can I get the PureThermal 1 to automatically power on when USB power is applied? A. 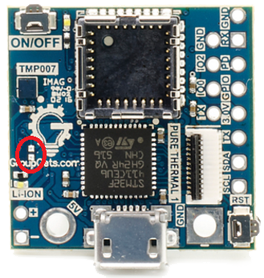 On the front of the board, near the groupgets logo there is an un-stuffed 0402 footprint (see the image below). If you solder down a 1k resistor there, the board will auto turn on when USB power is applied. The "v1.2" hardware version and newer that is shipping as of 07/2016 has this resistor placed by default.